The Package Support Framework is an open source kit that helps you apply fixes to your existing win32 application when you don't have access to the source code, so that it can run in an MSIX container. The Package Support Framework helps your application follow the best practices of the modern runtime environment. To learn more, see Package Support Framework. This guide will help you to identify application compatibility issues, and to find, apply, and extend runtime fixes that address them. First, create a package for your application. Then, install it, run it, and observe its behavior. You might receive error messages that can help you identify a compatibility issue. You can also use Process Monitor to identify issues. Common issues relate to application assumptions regarding the working directory and program path permissions. 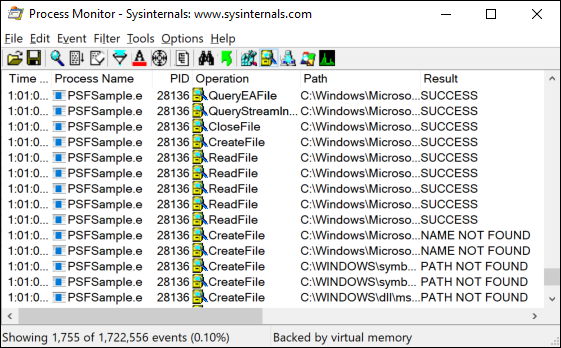 Process Monitor is a powerful utility for observing an app's file and registry operations, and their results. This can help you to understand application compatibility issues. 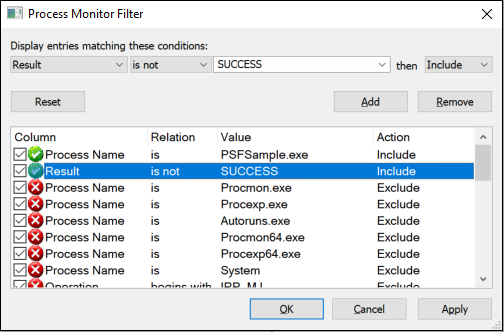 After opening Process Monitor, add a filter (Filter > Filter…) to include only events from the application executable. A list of events will appear. For many of these events, the word SUCCESS will appear in the Result column. Optionally, you can filter events to only show only failures. If you suspect a filesystem access failure, search for failed events that are under either the System32/SysWOW64 or the package file path. Filters can also help here, too. Start at the bottom of this list and scroll upwards. Failures that appear at the bottom of this list have occurred most recently. Pay most attention to errors that contain strings such as "access denied," and "path/name not found", and ignore things that don't look suspicious. The PSFSample has two issues. You can see those issues in the list that appears in the following image. 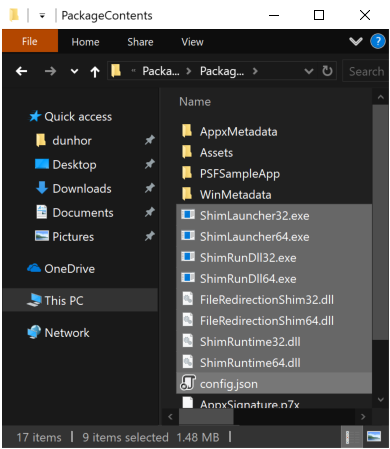 In the first issue that appears in this image, the application is failing to read from the "Config.txt" file that is located in the "C:\Windows\SysWOW64" path. It's unlikely that the application is trying to reference that path directly. Most likely, it's trying to read from that file by using a relative path, and by default, "System32/SysWOW64" is the application's working directory. This suggests that the application is expecting its current working directory to be set to somewhere in the package. Looking inside of the appx, we can see that the file exists in the same directory as the executable. The second issue appears in the following image. In this issue, the application is failing to write a .log file to its package path. This would suggest that a file redirection fixup might help. The PSF contains runtime fixes that you can use right now, such as the file redirection fixup. You can use the File Redirection Fixup to redirect attempts to write or read data in a directory that isn't accessible from an application that runs in an MSIX container. For example, if your application writes to a log file that is in the same directory as your applications executable, then you can use the File Redirection Fixup to create that log file in another location, such as the local app data store. Make sure to review the community contributions to our GitHub page. It's possible that other developers have resolved an issue similar to yours and have shared a runtime fix. 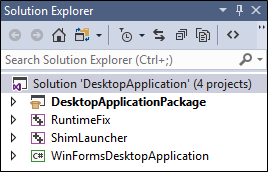 You can apply an existing runtime fix with a few simple tools from the Windows SDK, and by following these steps. Let's go through each task. This will give you something that looks like the following. If you don't have a .msix (or .appx) file to start with, you can create the package folder and files from scratch. You can get the PSF Nuget package by using the standalone Nuget command line tool or via Visual Studio. In Visual Studio, right-click your solution or project node and pick one of the Manage Nuget Packages commands. Search for Microsoft.PackageSupportFramework or PSF to find the package on Nuget.org. Then, install it. Add the required 32-bit and 64-bit PSF DLLs and executable files to the package directory. Use the following table as a guide. You'll also want to include any runtime fixes that you need. In our example, we need the file redirection runtime fix. Your package content should now look something like this. Open your package manifest in a text editor, and then set the Executable attribute of the Application element to the name of the PSF launcher executable file. If you know the architecture of your target application, select the appropriate version, PSFLauncher32.exe or PSFLauncher64.exe. If not, PSFLauncher32.exe will work in all cases. Here's an example. Create a file name config.json, and save that file to the root folder of your package. Modify the declared app ID of the config.json file to point to the executable that you just replaced. Using the knowledge that you gained from using Process Monitor, you can also set the working directory as well as use the file redirection fixup to redirect reads/writes to .log files under the package-relative "PSFSampleApp" directory. applications id Use the value of the Id attribute of the Application element in the package manifest. applications executable The package-relative path to the executable that you want to start. In most cases, you can get this value from your package manifest file before you modify it. It's the value of the Executable attribute of the Application element. applications workingDirectory (Optional) A package-relative path to use as the working directory of the application that starts. If you don't set this value, the operating system uses the System32 directory as the application's working directory. processes executable In most cases, this will be the name of the executable configured above with the path and file extension removed. fixups dll Package-relative path to the fixup, .msix/.appx to load. fixups config (Optional) Controls how the fixup dl behaves. The exact format of this value varies on a fixup-by-fixup basis as each fixup can interpret this "blob" as it wants. The applications, processes, and fixups keys are arrays. That means that you can use the config.json file to specify more than one application, process, and fixup DLL. Using PowerShell, install the package. Remember to uninstall the package first. Run the application and observe the behavior with runtime fix applied. Repeat the diagnostic and packaging steps as necessary. An alternative technique to diagnosing packaged application compatibility issues is to use the Trace Fixup. 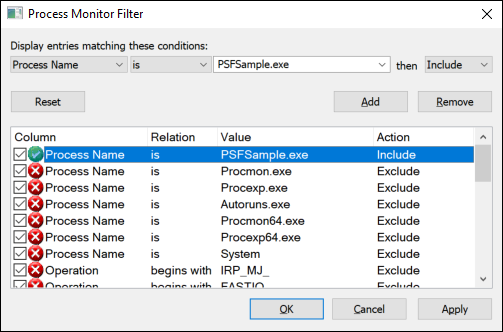 This DLL is included with the PSF and provides a detailed diagnostic view of the app's behavior, similar to Process Monitor. It is specially designed to reveal application compatibility issues. To use the Trace Fixup, add the DLL to the package, add the following fragment to your config.json, and then package and install your application. By default, the Trace Fixup filters out failures that might be considered "expected". For example, applications might try to unconditionally delete a file without checking to see if it already exists, ignoring the result. This has the unfortunate consequence that some unexpected failures might get filtered out, so in the above example, we opt to receive all failures from filesystem functions. We do this because we know from before that the attempt to read from the Config.txt file fails with the message "file not found". This is a failure that is frequently observed and not generally assumed to be unexpected. In practice it's likely best to start out filtering only to unexpected failures, and then falling back to all failures if there's an issue that still can't be identified. By default, the output from the Trace Fixup gets sent to the attached debugger. For this example, we aren't going to attach a debugger, and will instead use the DebugView program from SysInternals to view its output. After running the app, we can see the same failures as before, which would point us towards the same runtime fixes. You can use Visual Studio to debug a runtime fix, extend a runtime fix, or create one from scratch. You'll need to do these things to be successful. When you're done, your solution will look something like this. Let's look at each project in this example. DesktopApplicationPackage This project is based on the Windows Application Packaging project and it outputs the MSIX package. Runtimefix This is a C++ Dynamic-Linked Library project that contains one or more replacement functions that serve as the runtime fix. PSFLauncher This is C++ Empty Project. This project is a place to collect the runtime distributable files of the Package Support Framework. It outputs an executable file. That executable is the first thing that runs when you start the solution. WinFormsDesktopApplication This project contains the source code of a desktop application. To look at a complete sample that contains all of these types of projects, see PSFSample. Let's walk through the steps to create and configure each of these projects in your solution. 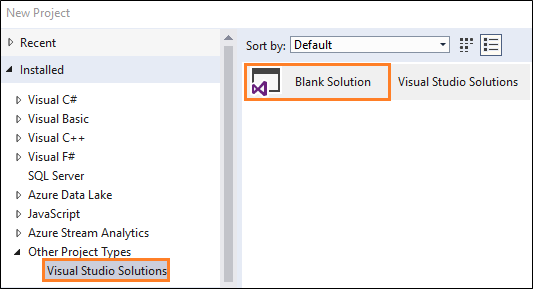 If you don't already have a solution for your desktop application, create a new Blank Solution in Visual Studio. You may also want to add any application projects you have. If you don't already have a Windows Application Packaging Project, create one and add it to your solution. 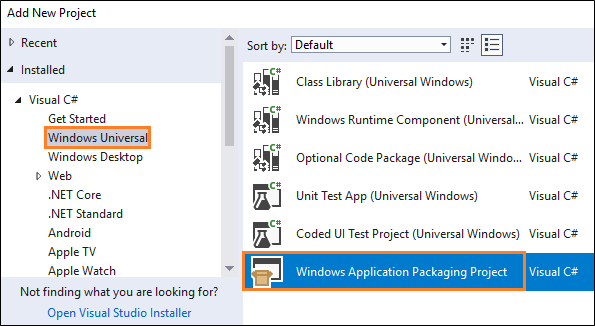 For more information on Windows Application Packaging project, see Package your application by using Visual Studio. 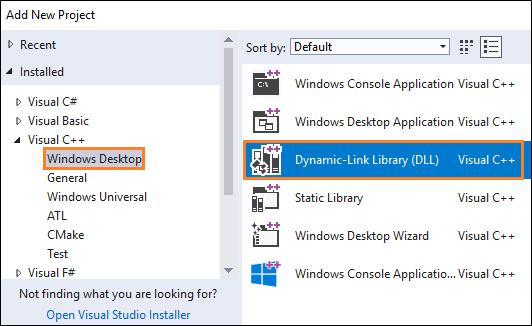 Add a C++ Dynamic-Link Library (DLL) project to the solution. Right-click the that project, and then choose Properties. In the property pages, find the C++ Language Standard field, and then in the drop-down list next to that field, select the ISO C++17 Standard (/std:c++17) option. Right-click that project, and then in the context menu, choose the Manage Nuget Packages option. Ensure that the Package source option is set to All or nuget.org. Click the settings icon next that field. Search for the PSF* Nuget package, and then install it for this project. If you want to debug or extend an existing runtime fix, add the runtime fix files that you obtained by using the guidance described in the Find a runtime fix section of this guide. If you intend to create a brand new fix, don't add anything to this project just yet. We'll help you add the right files to this project later in this guide. For now, we'll continue setting up your solution. Add a C++ Empty Project project to the solution. 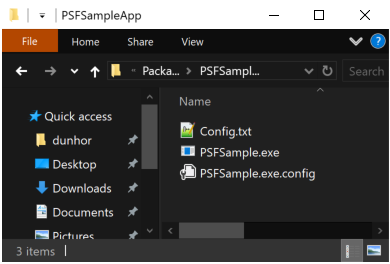 Add the PSF Nuget package to this project by using the same guidance described in the previous section. Open the property pages for the project, and in the General settings page, set the Target Name property to PSFLauncher32 or PSFLauncher64 depending on the architecture of your application. 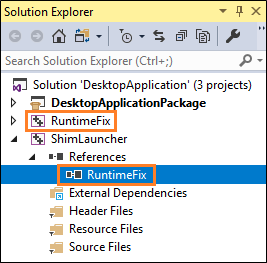 Add a project reference to the runtime fix project in your solution. Right-click the reference, and then in the Properties window, apply these values. In the packaging project, right-click the Applications folder, and then choose Add Reference. Choose the PSF launcher project and your desktop application project, and then choose the OK button. If you don't have the source code to your application, just choose the PSF launcher project. 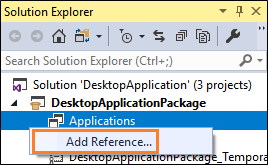 We'll show you how to reference your executable when you create a configuration file. 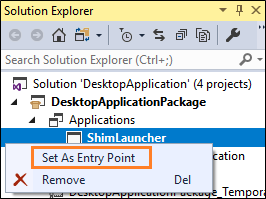 In the Applications node, right-click the PSF launcher application, and then choose Set as Entry Point. Add a file named config.json to your packaging project, then, copy and paste the following json text into the file. Set the Package Action property to Content. Provide a value for each key. Use this table as a guide. fixups dll Package-relative path to the fixup DLL to load. fixups config (Optional) Controls how the fixup DLL behaves. The exact format of this value varies on a fixup-by-fixup basis as each fixup can interpret this "blob" as it wants. When you're done, your config.json file will look something like this. In Visual Studio, press F5 to start the debugger. The first thing that starts is the PSF launcher application, which in turn, starts your target desktop application. To debug the target desktop application, you'll have to manually attach to the desktop application process by choosing Debug->Attach to Process, and then selecting the application process. To permit the debugging of a .NET application with a native runtime fix DLL, select managed and native code types (mixed mode debugging). Once you've set this up, you can set break points next to lines of code in the desktop application code and the runtime fix project. If you don't have the source code to your application, you'll be able to set break points only next to lines of code in your runtime fix project. While Visual Studio gives you the simplest development and debugging experience, there are some limitations, so later in this guide, we'll discuss other debugging techniques that you can apply. If there isn't yet a runtime fix for the issue that you want to resolve, you can create a new runtime fix by writing replacement functions and including any configuration data that makes sense. Let's look at each part. First, identify which function calls fail when your application runs in an MSIX container. Then, you can create replacement functions that you'd like the runtime manager to call instead. This gives you an opportunity to replace the implementation of a function with behavior that conforms to the rules of the modern runtime environment. 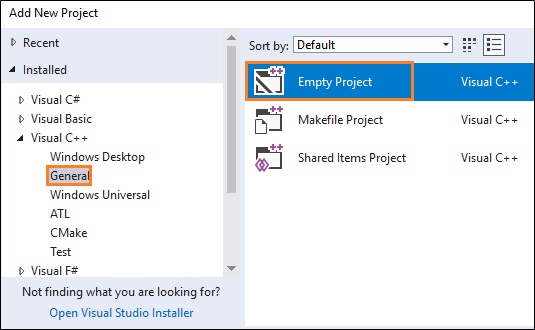 In Visual Studio, open the runtime fix project that you created earlier in this guide. Declare the FIXUP_DEFINE_EXPORTS macro and then add a include statement for the fixup_framework.h at the top of each .CPP file where you intend to add the functions of your runtime fix. Make sure that the FIXUP_DEFINE_EXPORTS macro appears before the include statement. Create a function that has the same signature of the function who's behavior you want to modify. Here's an example function that replaces the MessageBoxW function. The call to DECLARE_FIXUP maps the MessageBoxW function to your new replacement function. When your application attempts to call the MessageBoxW function, it will call the replacement function instead. You can optionally apply the reentrancy_guard type to your functions that protect against recursive calls to functions in runtime fixes. For example, you might produce a replacement function for the CreateFile function. Your implementation might call the CopyFile function, but the implementation of the CopyFile function might call the CreateFile function. This may lead to an infinite recursive cycle of calls to the CreateFile function. If you want to add configuration data to your runtime fix, consider adding it to the config.json. That way, you can use the FixupQueryCurrentDllConfig to easily parse that data. This example parses a boolean and string value from that configuration file. While Visual Studio gives you the simplest development and debugging experience, there are some limitations. 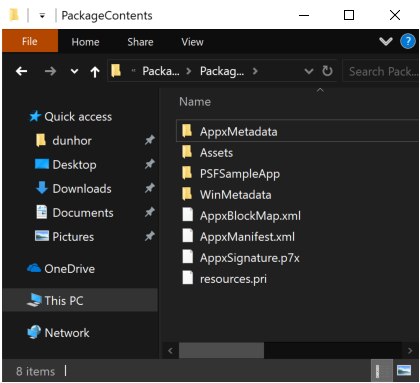 First, F5 debugging runs the application by deploying loose files from the package layout folder path, rather than installing from a .msix / .appx package. The layout folder typically does not have the same security restrictions as an installed package folder. As a result, it may not be possible to reproduce package path access denial errors prior to applying a runtime fix. To address this issue, use .msix / .appx package deployment rather than F5 loose file deployment. To create a .msix / .appx package file, use the MakeAppx utility from the Windows SDK, as described above. Or, from within Visual Studio, right-click your application project node and select Store->Create App Packages. Another issue with Visual Studio is that it does not have built-in support for attaching to any child processes launched by the debugger. This makes it difficult to debug logic in the startup path of the target application, which must be manually attached by Visual Studio after launch. To address this issue, use a debugger that supports child process attach. Note that it is generally not possible to attach a just-in-time (JIT) debugger to the target application. This is because most JIT techniques involve launching the debugger in place of the target app, via the ImageFileExecutionOptions registry key. This defeats the detouring mechanism used by PSFLauncher.exe to inject FixupRuntime.dll into the target app. WinDbg, included in the Debugging Tools for Windows, and obtained from the Windows SDK, supports child process attach. It also now supports directly launching and debugging a UWP app. To debug target application startup as a child process, start WinDbg. At the WinDbg prompt, enable child debugging and set appropriate breakpoints. 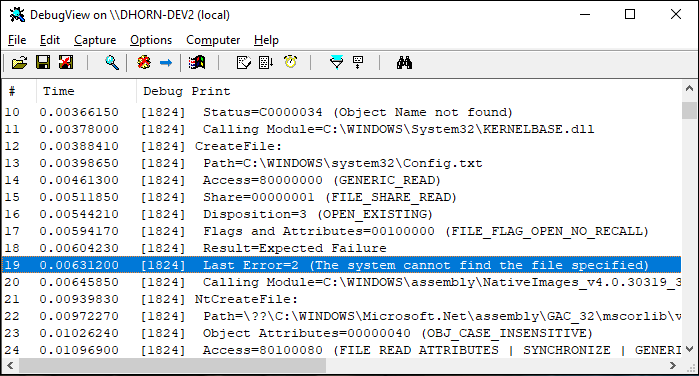 PLMDebug can be also used to attach a debugger to an app upon launch, and is also included in the Debugging Tools for Windows. However, it is more complex to use than the direct support now provided by WinDbg.